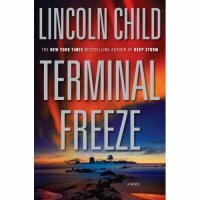 Book Review: Terminal Freeze | What Would The Founders Think? In Terminal Freeze, some scientists stationed at a remote outpost in Alaska, a mothballed military facility manned by handful of soldiers, make a discovery in an ice cave uncovered by a melting glacier. It's a huge frozen creature. I’d grown tired of Preston and Child’s collaborations featuring Pendergast, D’Agosta and the rest of the characters introduced in The Relic. I feel that they have exhausted the franchise. So, it was with some reluctance that I picked up Lincoln Child‘s solo effort, Terminal Freeze. I was pleasantly surprised, this was a fun book. In it, some scientists stationed at a remote outpost in Alaska, a mothballed military facility manned by handful of soldiers, make a discovery in an ice cave uncovered by a melting glacier. It’s a huge frozen creature. Well, since they’re being funded by a media network, they feel obligated to report their find. Pandemonium ensues when hoards of television people descend on the scene and make plans to film a docudrama which will culminate in thawing out the creature in front of millions of viewers on live television. When the creature disappears before the grand finale scene is filmed, all hell breaks loose. It seems as though someone stole it, but why? It’s a pretty good story, although the ending tries to borrow from some of the authors other books. It’s fun, entertaining and a quick read.